Maybe it was prescient to name Hit that name, as the series was a hit. Like most successes, there's always a yearning to revisit that universe and explore the characters a bit more in the process. BOOM! Studios appreciates that as much as the next publisher and is releasing Hit 1957 #1. 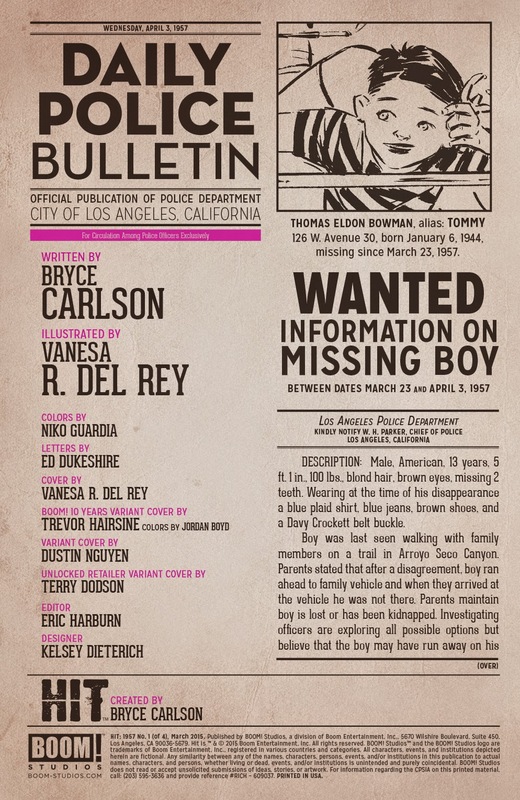 The issue is written by Bryce Carlson, illustrated by Vanesa R. Del Rey, colored by Niko Guardia and lettered by Ed Dukeshire. Crime is down in Los Angeles—at least, on the surface. Mickey Cohen has been quiet since his release from prison and the LAPD has seemingly regained control of the city. But the underground is a different story. Det. 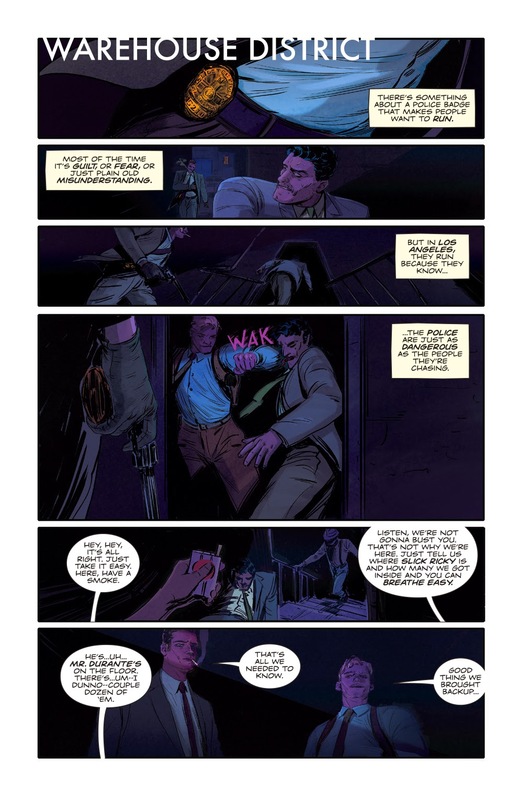 Harvey Slater and company have spent the last two years focused on Domino and his Syndicate’s unrelenting infiltration, but no matter how many people the hit squad kills, the real fight for Los Angeles rages on. Meanwhile, Slater’s being hounded by Internal Affairs, Bonnie Brae is missing and everything is falling apart at the seams. 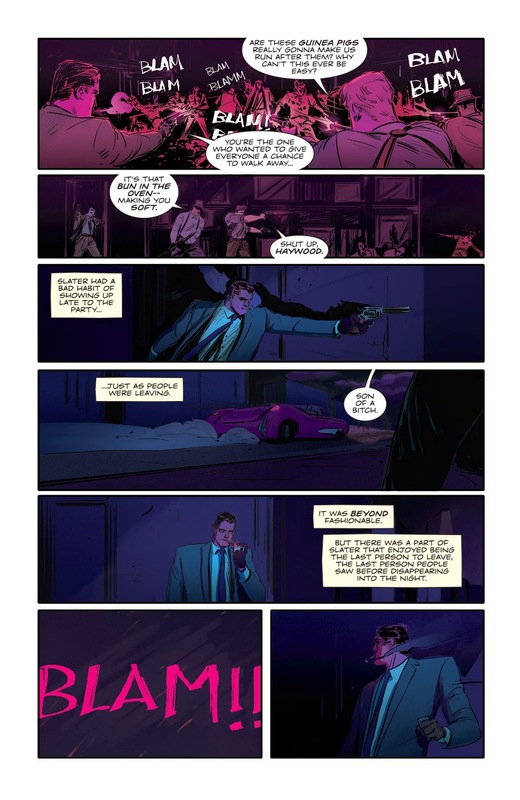 Like Hit before it, Hit 1957 #1 delves deep into the LA crime scene of the 1950s and Carlson's take on it is impressive. 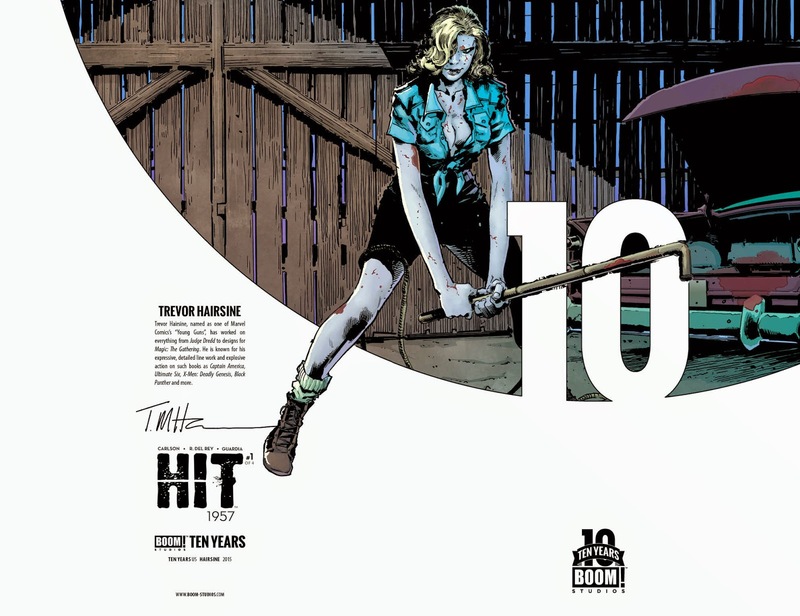 Anyone who read Hit will recognize all the key players are back and exchanging words with one another in a very hard-boiled style. 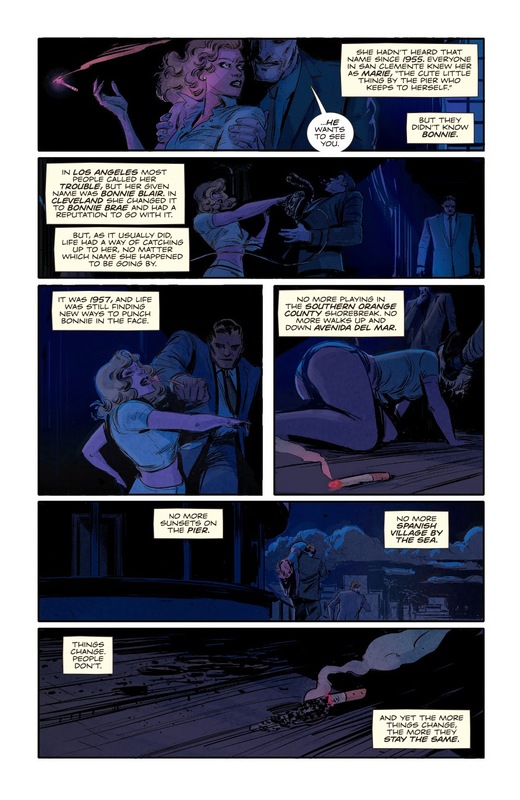 It really plays well into the atmosphere and setting of Hit 1957 #1, as Carlson is unapologetic in his delivery of the plot. That plot is a little jumpy from time to time, as it traverses between the various worlds of the main characters, but eventually it settles down and the larger story starts coming into focus. Carlson infuses character with an abundance of personality that sparks fireworks when those personalities cross path with one another. Just like keeping Carlson on to write the follow-up, keeping Del Rey for the art maintains a fantastic continuity with the property. 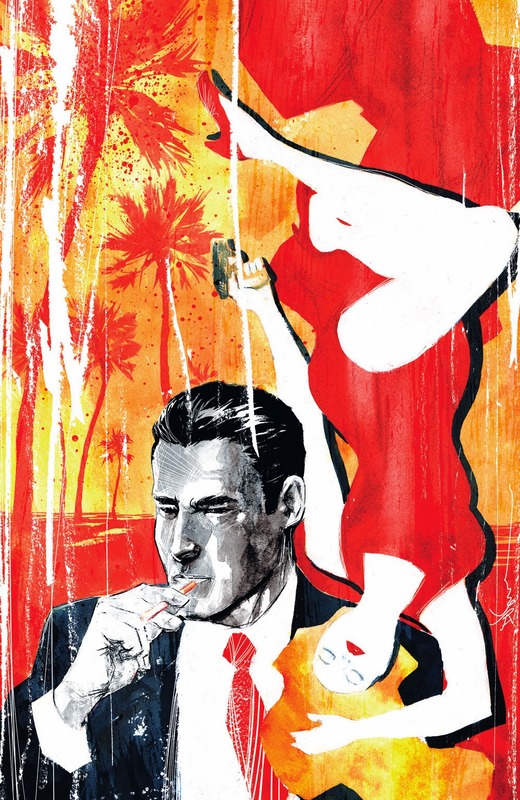 Her work has a cinematic feel to it befitting of a plot centered on crime in LA in the 1950s, as a variety of angles give the reader fresh looks at characters. 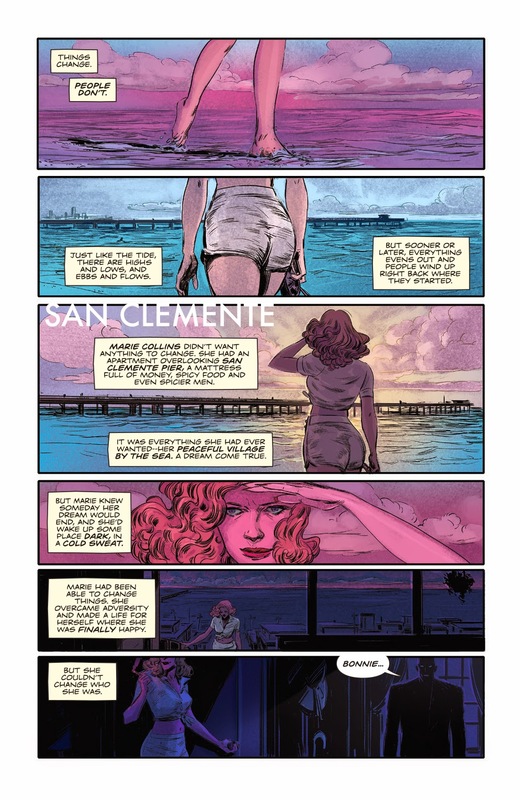 Del Rey's style doesn't rely on overemphasizing details in characters and settings, which adds a certain level of intrigue to the characters themselves. And each page is stacked with panels full of action and each panel meticulously follows along in a way that breaks down the action shot for shot in a storyboard fashion. Guardia adds a certain level of mystery to the characters and events as well thanks to a choice of colors that are largely darker in nature. 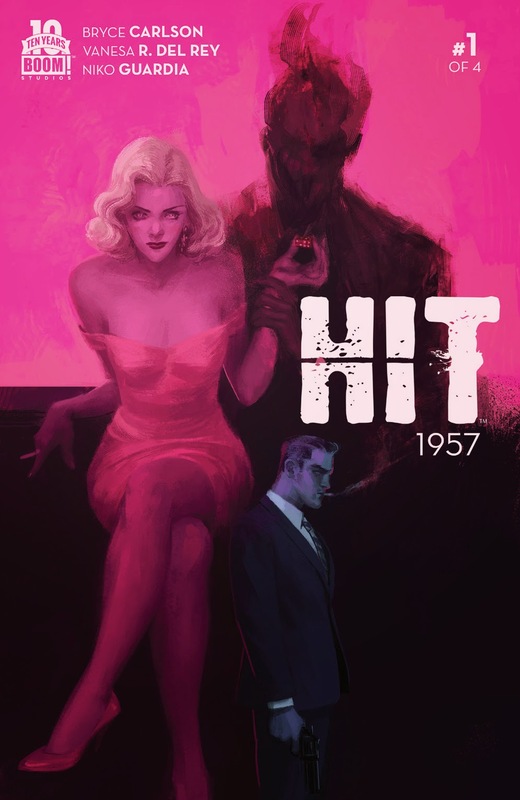 Fans of Hit will feel right at home with Hit 1957 #1, as it continues with the same universe. There's a lot of appeal in that setting and with characters who are quickly becoming fully realized, it offers a lot of great interactions. Carlson doesn't miss a step in picking up the story and delving deeper into the character relationships. Del Rey's linework is heavy and deliberate, striking a great balance between being emphatic and dark. 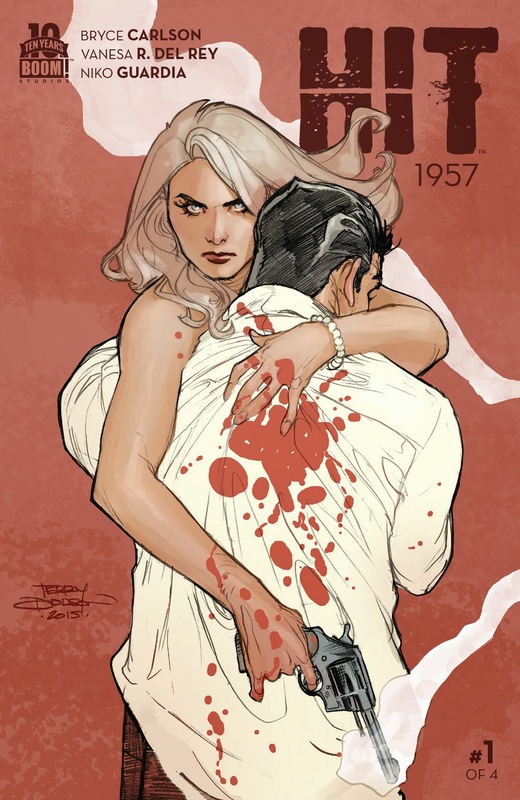 Hit 1957 #1 is a good first issue for those who followed the first series; for those who didn't, it might be worth checking that out first before delving into Hit 1957 #1. 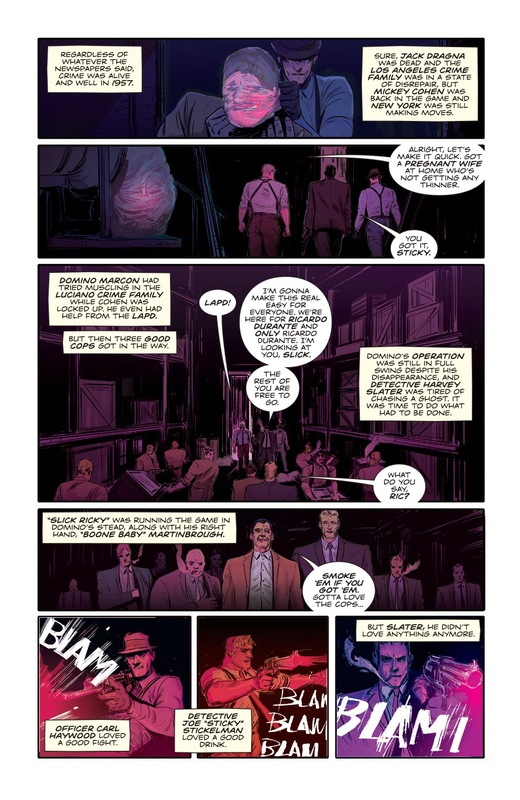 Hit 1957 #1 is in stores now with interiors below.